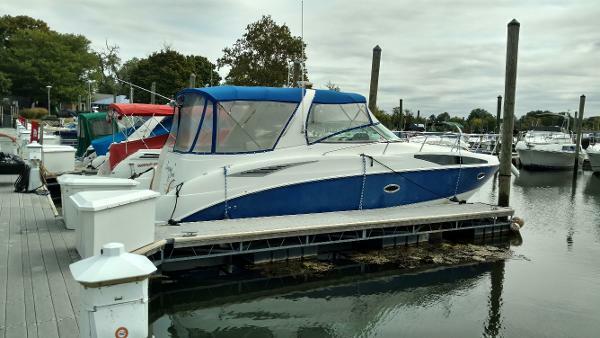 2007 Bayliner 325 SB THIS HARD TO FIND MODEL IS LOADED WITH OPTIONS, HAS LOW HOURS AND IS IN GREAT SHAPE, THE COCKPIT IS ONE OF THE ROOMIEST WE HAVE SEEN, WITH A SWIVEL CAPTIANS CHAIR AND WRAP AROUND REAR SEAT AND LARGE BENCH SEAT. ALSO HAS A COCKPIT FRIDGE AND SINK. 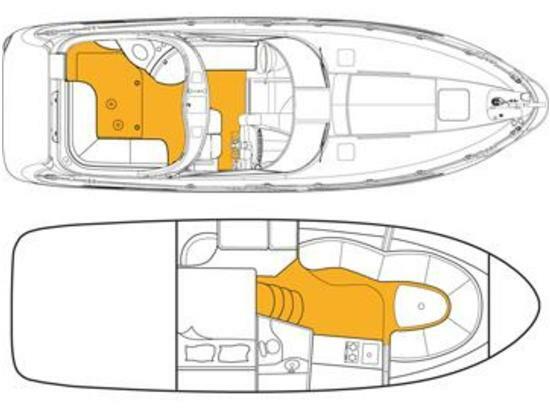 THE CABIN IS ALSO VERY ROOMY WITH A VERY LARGE PRIVATE AFT CABIN. THE BOW DINETTE AREA EASILY CONVERTS TO A LARGE SLEEPING AREA WITH PRIVACY SHADE. WITH A GENERATOR AND AIR CONDITIONER YOU STAY COMFORTABLE WHILE CRUISING. IT IS POWERED WITH TWIN 350 MAG MPI BRAVO 3 MERCRUISER'S WITH ONLY 78 HOURS. OTHER FEATURES INCLUDE VACU FLUSH HEAD, LARGE CABIN FRIDGE, COFFEE MAKER, MICROWAVE, TV WITH DVD PLAYER, STOVE TOP, CABIN SCREEN DOOR, WALK THRU WINDSHIELD, WINDLASS SPOTLIGHT, COMPASS, POWER ENGINE HATCH LIFT, TRIPLE BATTERIES, AUTOMATIC FIRE SUPPRESSION, BELLOWS HAVE BEEN REPLACED AND BOTTOM HAS BEEN ROCOATED. ALSO COMES WITH CAMPER CANVAS AND COCKPIT COVER. 2007 Bayliner 325, This sleek 2007 Bayliner Sunbridge combines a spacious cockpit, and cabin with well-appointed spaces for entertaining, overnighting and just plain fun. Power-assisted rack and pinion steering directs standard twin 5.7L Mercury MerCruiser engines, making it easy to relax. Below deck are all the conviences of home: TV, VCR, and coffeemaker. Perfect for overnight trips and all day cruising, you'll feel miles from the ordinary. Well-equipped with all the high-demand features made standard, including a cockpit entertainment center, a molded fiberglass radar arch and a galley complete with refrigerator, dual-burner stove and microwave. 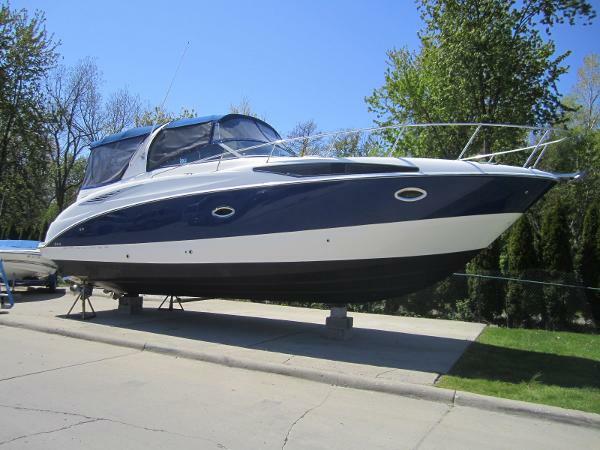 2005 Bayliner 325 BIG, ROOMY CRUISER! 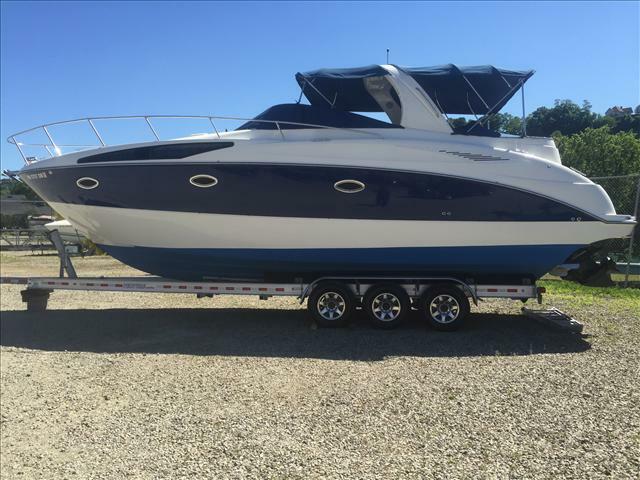 !Check out this beautiful 2005 Byliner 325 Express...At nearly 35' LOA and a generous 11' 6" beam, This cruiser has plenty of room for weekends and long excursions! Her spacious cabin boasts 6' 4" headroom, Generator, Air/Heat, a private mid-cabin, TV/DVD, CD Stereo, Vacu-Flush head and a Generator to keep it all running while you spend time on the hook!! 2007 Bayliner 325 The Bayliner 325 is the best value in its class, combining spacious cockpit and cabin with well-thought-out arrangements for both entertaining and overnighting. This vessel has maticulously maintained and is in exellent condition. A true turn key cruiser. 2007 Bayliner 325 Sun Bridge Desirable larger engine package twin 350 MAG MerCruiser MPI's (300 hp) each - ($4500 upgrade). Complete engine service and generator service January 2016 to include - Engines - all filters, fluids, thermostats, manifolds and risors, anoids and more. Also, (2) Proflush engine flush units installed. Outdrives - completely removed, serviced gimbals and bellows, new hydraulic lines. Generator - changed oil, filter, plugs, thermostat, new exhaust hose and impeller. 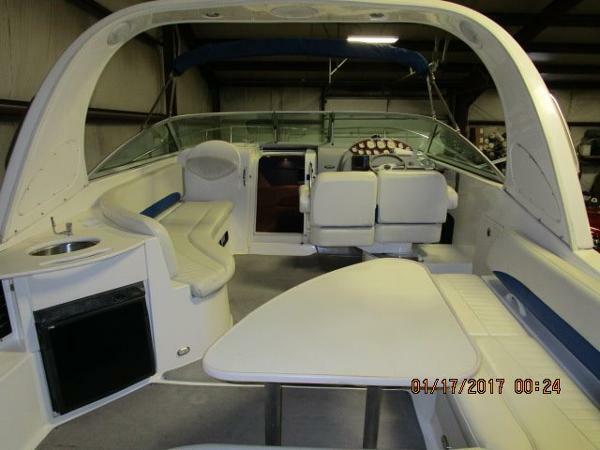 It also has a Awlgrip blue hull in great shape.Lots of extra options and update.Please read listing for further detail.Seller is very meticulous and looking for an offer. 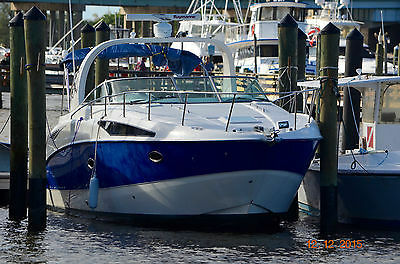 You are viewing a 2006 Bayliner 325 This low hour (176 hrs.) 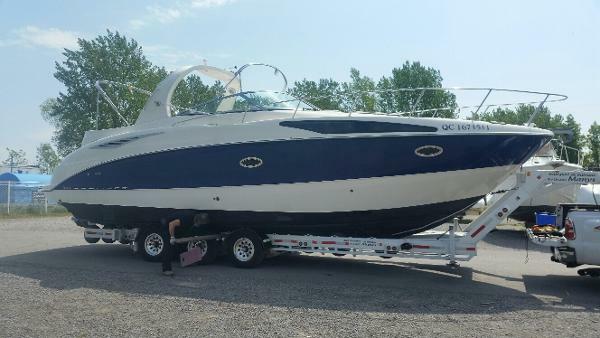 Bayliner was just traded in to us, and is priced for a quick sale! Just serviced. 5.0KW Koeler generater, airconditioning, water maker,Ray Marine Radar, GPS, Depth finder, Electric anchor windless, remote spotlight, removable snap-in carpets, Boat has never been slept in. Very lightly used. 5.0 MPI Mercruisers with Bravo III drives. Extended warranty available! 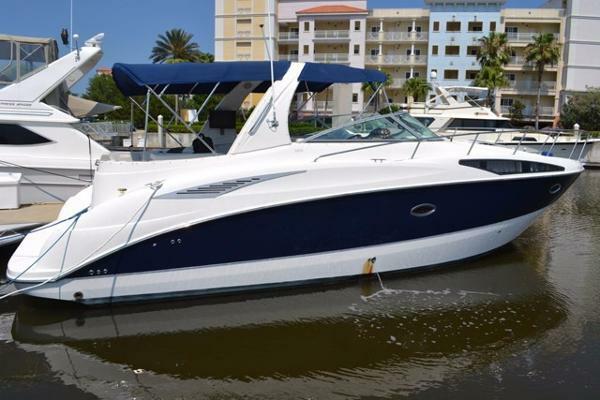 Boat is in the West Palm Beach, Florida area just 10 minutes from Palm Beach International Airport. Inspections are welcomed. Trades Ok. Shown by appointment only! We can assist with Export, Shipping cradles, shrink wrap and well as inland and ocean freight rate quotes.Call Mark 561-346-0733 Explore, escape, or just splash around all day and then cook a full meal and spend the night. Cruisers are the ultimate family boating experience. 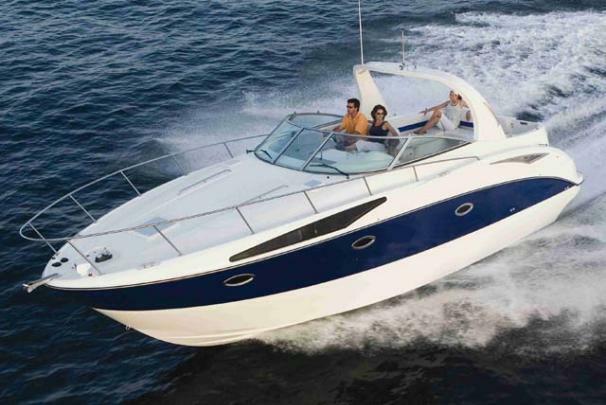 The 2006 Bayliner 325 is the best value in its class, combining spacious cockpit and cabin with well-thought-out arrangements for both entertaining and overnighting. Following are 2006 Byliner 325 factory specs:Length overall (LOA)35'0" (10.67 m)Beam11'6" (3.51 m)Deadrise18°Approximate weight w/standard engine12,870 lb (5,837.8 kg)Length rigged35'11" (10.95 m)Draft hull2'2" (.66 m)Draft max3'4.5" (1.03 m)Bridge clearance max10'6.5" (3.21 m)Fuel capacity175 gal (662.9 L)Holding tank capacity30 gal (113.9 L)Model Name Length32'Water capacity31 gal (117 L)Standard FeaturesCabin 110V Outlet: Ground Fault Protected AM/FM Stereo & CD Controller: w/Speakers (2) Aft Double Berth Coax Cable for TV Antenna Dinette Table Hanging Locker Opening Window TV & VCR: TV in V-Berth/VCR in Galley V-Berth (Cushioned): w/Storage below Window CurtainsCanvas Bimini Top: w/BootCertifications Meets Applicable USCG Standards NMMA CertifiedCockpit 110V Outlet: Ground Fault Protected Aft L-Shaped Lounger: Converts to Sunlounger Beverage Holders Carry-On Cooler (36-Qt): w/Storage Niche Courtesy Lights Engine Access Hatch Entertainment Center: w/Sink, Faucet & Storage Cabinet Helm Seating: w/Flip-Up Bolster Molded Fiberglass Radar Arch: w/Recessed Lighting & Weatherproof Speakers (2) Molded Steps: Access to Foredeck Removable Table Storage Locker Transom DoorConstruction Features 100% Polypropylene Carpeting: Solution-Dyed, Stain & Fade-Resistant Color-Coded Electrical System Handlaid Fiberglass Heavy-Duty Marine-Grade Vinyls: Expanded Back 29 Ounces/Linear Yard & 45 Gauge SRS™ Hull Design Textured Surface Decks We have performed a mechanical evaluation & water tested it and she runs like a champion - the motors has good/even compression on all cylinders. Surveys and mechanical inspections are welcome. Sold as-is, where-is. 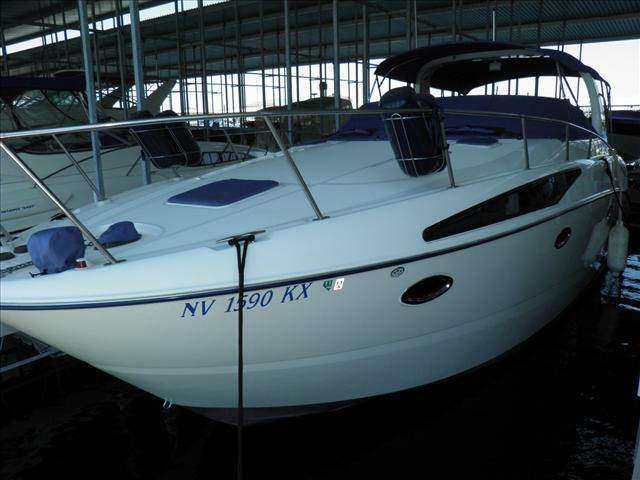 2006 Bayliner 325, **PRICE REDUCTION** Twin 5.0L EFI Mercruiser engines coupled to Bravo III outdrives (240 hours). Kohler 5 kW GenSet (33 hours). Marine air conditioning, windlass, vacu-flush system, camper enclosure and much more. Located in a premium covered slip at Las Vegas Boat Harbor. Call 702-293-3484 Today The 325 offers increased capacities and more spacious accommodations sought after in a larger cruiser.